In light of Anthony Watts’ latest idiocy comparing GISS and UAH temperature data without bothering to put them on the same scale, I thought it might be interesting to compare different temperature records … but let’s do it right, eh? There are 5 major sources of global temperature data which are most often referred to. Three of them are estimates of surface temperature, from NASA GISS (Goddard Institute for Space Studies), HadCRU (Hadley Centre/Climate Research Unit in the U.K.), and NCDC (National Climate Data Center). The other two are estimates of lower-troposphere temperature, from RSS (Remote Sensing Systems) and UAH (Univ. of Alabama at Huntsville). All are anomaly data, i.e., the difference between temperature at a given time and that during a baseline period. 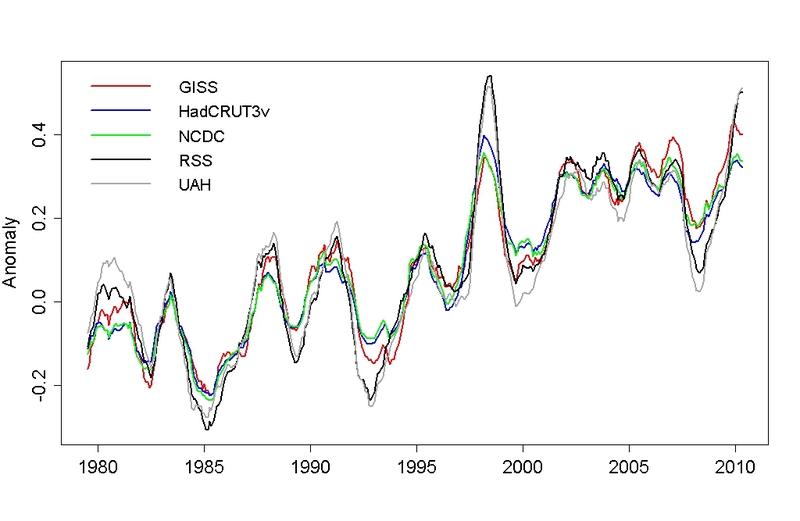 They tend not to be on the same baseline; for GISS the baseline is 1951 to 1980, for HadCRU it’s 1961 to 1990, for NCDC it’s the 20th century, and for satellite data the baseline is 1979 to 1999. Since they use different baselines, they’re on a different scale, i.e., each has its own zero point for temperature. To compare them, we need to use the same zero point for all. They also don’t cover the same time span. HadCRU starts first, beginning in 1850. GISS and NCDC both start in 1880. And the satellite data don’t start until December 1978 (for UAH) or January 1979 (for RSS). You can download the data yourself; links to data sources are found here. Because of this, the RSS and UAH data cannot be put on the baseline used by any of the surface-temperature data sets because the satellite data don’t cover those time periods. Of course we can only compare them for those times they all have data. And to put them all on the same scale, we’ll have to use a baseline period which is covered by all. Now we can plainly see that all they tell much the same story, in terms of the temperature changes over time. Which is what anomalies are meant to reveal. But we can also see the result of using different baselines. GISS and NCDC are nearly the same, because the average for the GISS baseline period (1951-1980) is nearly the same as that for the NCDC baseline (20th century). HadCRUT3v is lower because it’s baseline period (1961-1990) is warmer (so it’s compared to a warmer reference). 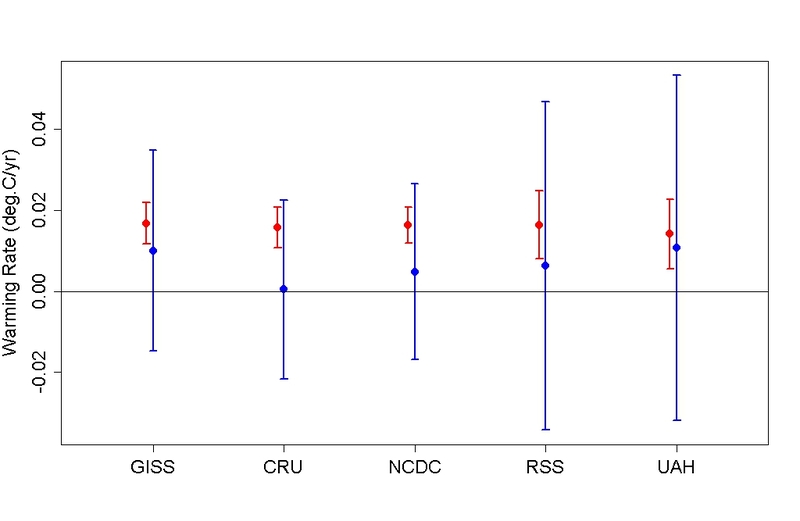 Finally, the satellite data sets are lowest because their baseline period is warmest. Note that now the different data sets are in much closer numerical agreement. They all show warming during the coverage period, and they all show fluctuations superimposed on the warming trend. 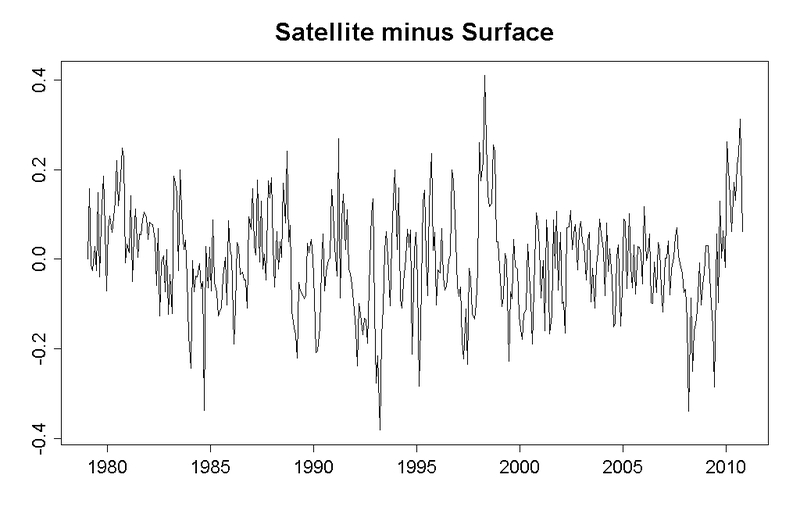 But the satellite data sets show greater fluctuations, especially during el Nino events (e.g. 1998) and la Nina events (2008), and during the coolings associated with volcanic eruptions (El Chicon in the early 1980s and Mt. Pinatubo in the early 1990s). Therefore the most prominent pattern in the data appears to be that which is shared by all: an overall warming trend, and warming in response to el Nino, cooling in response to la Nina and volcanic eruptions. 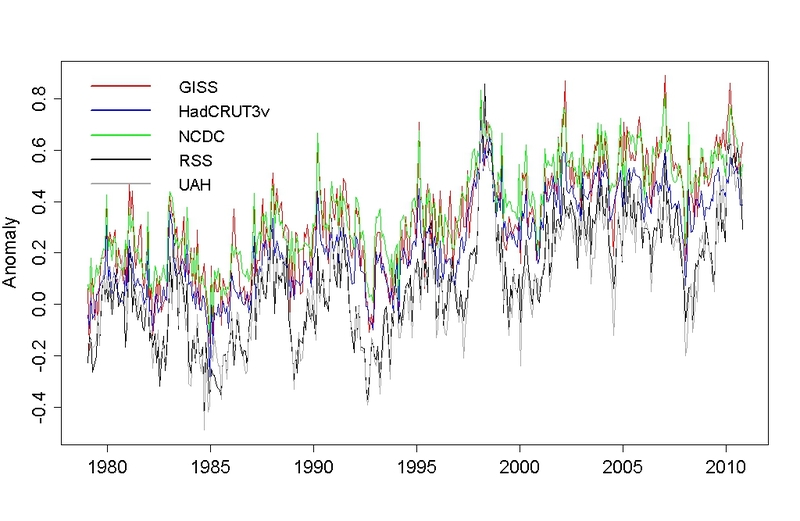 The 2nd-most prominent pattern appears to be the difference between the satellite data sets (RSS and UAH) and the surface-temperature data sets (GISS, HadCRUT3v, and NCDC). All 5 data sets agree: the globe is warming. The biggest difference between the satellite-minus-surface data and PC#2 is that PC#2 shows an additional downward trend. This is mainly because one of the satellite data sets (UAH) shows an overall trend which is decidedly less than that of the other data sets. We can plainly see the highs during the 1998 and 2010 el Ninos, and the lows during the 2008 la Nina as well as the volcanic coolings in the early 1980s and early 1990s. This indicates that the satellite data (i.e., the lower-troposphere temperature) responds more strongly to the influence of el Nino/la Nina and to volcanic eruptions, than does the surface temperature. 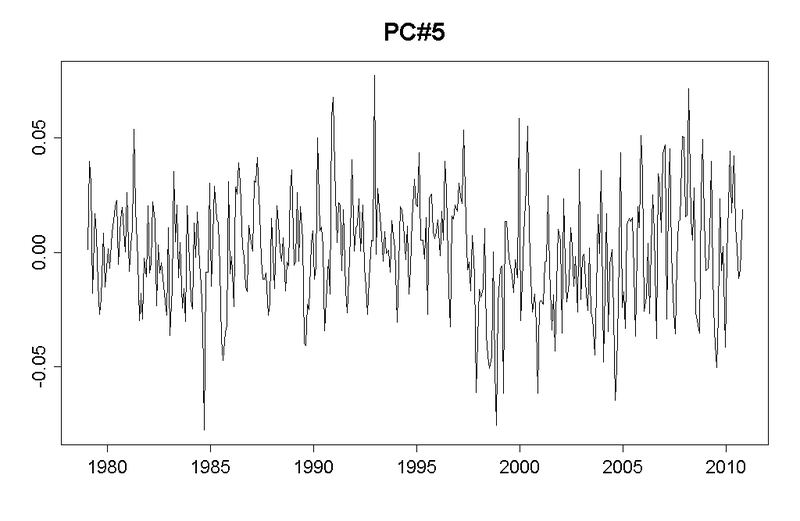 All but 2 of the coefficients are very small, so PC#5 turns out to be mainly the difference between NCDC and HadCRUT3v. Hence we see that their difference shows an annual cycle, because during this time span NCDC is warmer in winter and cooler in summer than HadCRUT3v, although there’s also a “dip” in January-February compared to December and March. This illustrates that although the choice of baseline period makes no difference when computing the trend (i.e., the rate of global warming), it does make a difference when estimating the annual (seasonal) cycle. 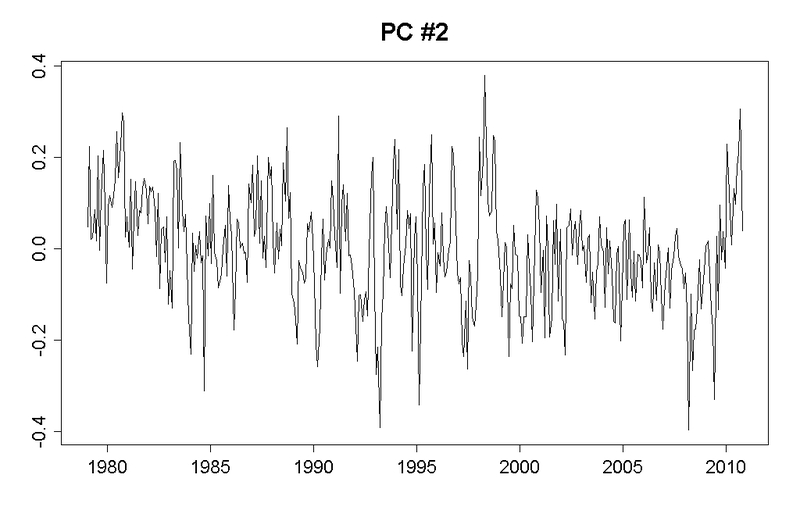 When anomalies are computed, not only does it set the “zero point” of temperature to the baseline average, it also removes the annual cycle from the data. But it removes the average annual cycle during the baseline period. If the annual cycle changes, then the difference between “present” and “baseline” annual cycles will remain — a “residual” annual cycle. 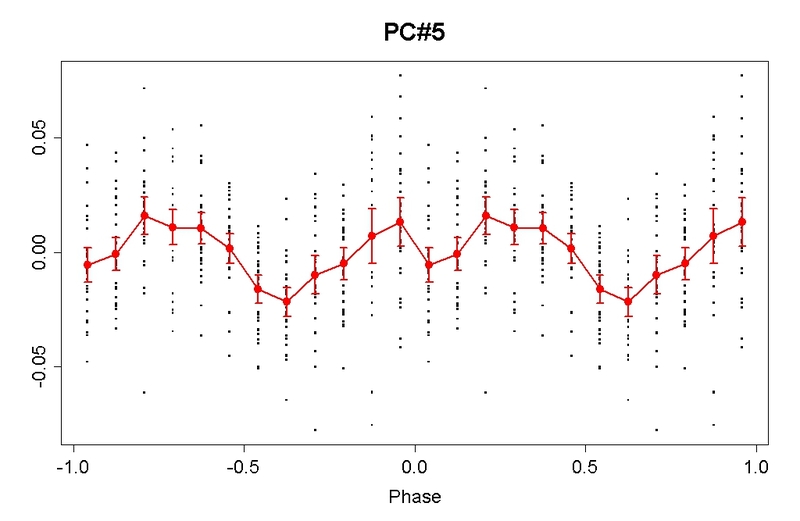 PC#5 shows that the residual annual cycles in NCDC and HadCRUT3v are different — hence a difference in annual cycle “remnants” is found in PC#5. They’re all close, all within each others’ confidence intervals, and they’re all definitely positive (warming). However, the UAH trend estimate is visibly lower than that of the others — if any of the series should be called the “odd man out,” it’s the UAH data. None of the 10-year trends is “statistically significant” but that’s only because the uncertainties are so large — 10 years isn’t long enough to determine the warming trend with sufficient precision. Note that for each data set, the full-sample (about 30 years) trend is within the confidence interval of the 10-year trend — so there’s no evidence, from any of the data sets, that the trend over the last decade is different from the modern global warming trend. When one compares the different global temperature data sets correctly, one result emerges more strongly than any other: that they agree. This puts the lie (yes, lie) to claims of “fraud” by climate scientists to rig the surface temperature data. And what do all the data sets agree on? Mainly this: global warming. Here’s a dream come true for those who have unending problems with the GISS analysis: behold, the world without GISS! And the point about the “residual annual cycle” is (for me at least) intriguingly unexpected, though logical. Off-topic, but I’ve a new article out today, sort of a thematic science summary piece. Comments, suggestions and corrections are particularly solicited as this is a little more scientifically ambitious than previous pieces I’ve done, and chances for significant scientific screw-ups by this layman are presumably enhanced accordingly. So let me know, before I join “the Dark Side” to misinform, too–albeit inadvertently. . . 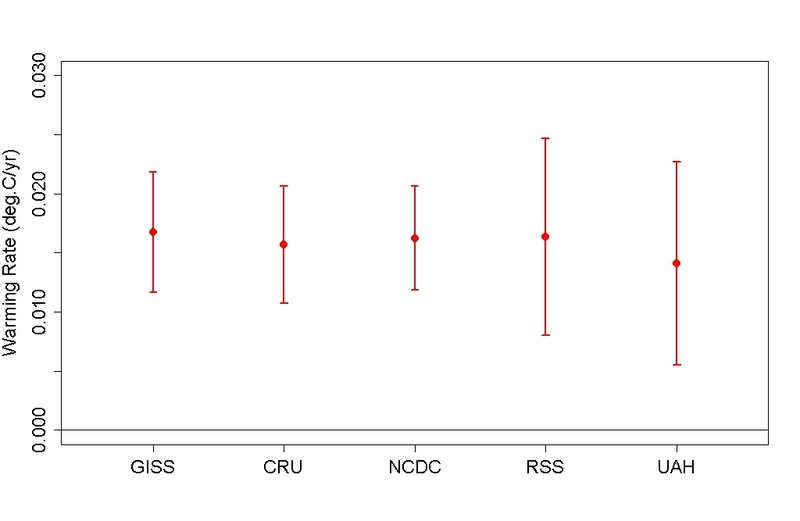 Does this bias affect HadCRU, GISS, and NCDC evenly? Cool post Tamino. A couple of questions. Should the variance of the data sets be standardized? Would this make any difference? If you weight the 5 different means equally (and assume the sets are independent) and perform a t-test, you probably do get 2-sigma significance. 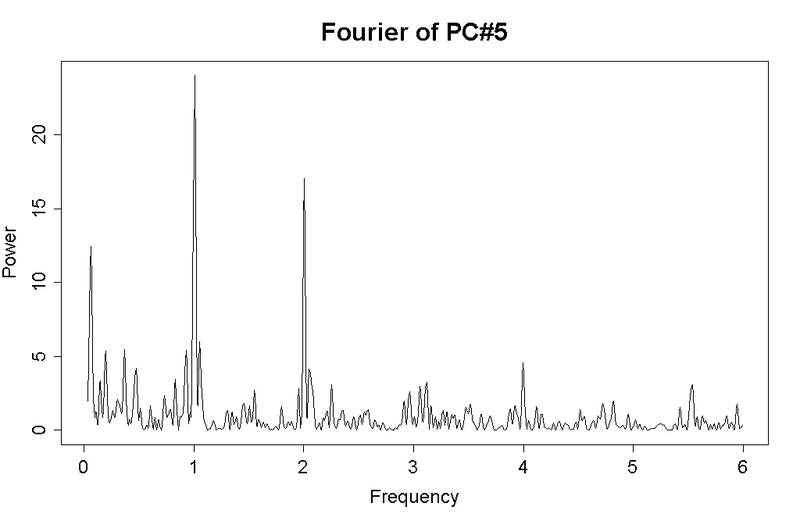 Guessing the data from the image gives p = .03. Obviously, this isn’t going to convince anyone who doesn’t understand the baseline effect. 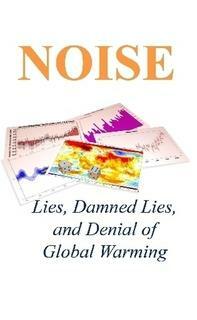 The samples also aren’t independent; the significant noise is natural variation and not measurement error. So, you can say with confidence that it’s warmed over the past decade. Also, why compute the trend with a linear fit? You have plenty of data to do so with a high degree of certainty. Fitting the GISS series, estimating error by bootstrapping, the linear component is 0.003 +/- 0.08 degrees/century and the quadratic component is 0.44+/- 0.07 degrees/century^2. From the GISS data, you can say “the earth is currently warming at 1 degree/century, and it’ll be getting warming twice that fast a year from now if we don’t do anything” with a good deal of confidence. I think there’s some value in getting beyond the slam-your-head-on-the-wall “debate” over warming exists and communicating that it’s getting faster each year we do nothing. Note that this is only using the yearly GISS data through 2007 so the numbers are too low. The focus on 10 year trends in this particular case was simply used to highlight the irony that UAH and GISTemp have roughly the same trend over the period, given the focus of Watts and others on comparing the two every month. I agree with you that the last decade really doesn’t tell you that much about the long term trends, given the size of the error bars, but it does allow for some interesting analysis of the difference between individual temperature records during that period (e.g. ENSO responses of satellites vs. surface measurements, effects of different ways of treating arctic temperatures, etc.). Regardless, there is a good reason why climate tends to focus on long-term trends! As shown on the above graphic, you can’t be very certain about short term trends but, by all indications, you can be certain that someone (somewhere) will continue the obsession with them. …just as you can be certain that someone somewhere will continue the confusion over different baselines. …and continue to claim that the atmospheric CO2 increase is not due to humans. It appears that Benjamin Franklin was actually wrong: taxes and death are not the only things in life that are certain. [Response: Reminds me of the Einstein quote, that only two things are infinite — the universe and human stupidity — and we’re not sure about the universe. 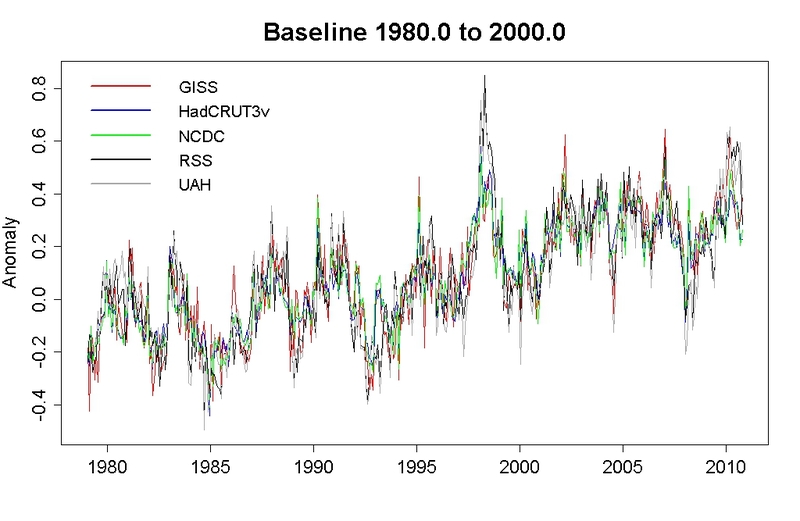 To illustrate their “irrelevance” (with regard to long term term trends specifically and climate generally) it would seem important to show (graphically, as above) or at the very least specify the uncertainty associated with each calculated trend — as opposed to just giving the “bare” trends. What are the loadings for the first principal component? Does anyone know of some decent articles investigating or reviewing why the microwave sounders are so sensitive to ENSO and the volcanic forcing? I was starting to look into this semi-formally a while ago – I suspect the real problem is that the microwave units are still not fully accounting for long-term drift/calibration issues properly. ENSO is short-term, and so they’re seeing the predicted mid-tropospheric amplification there (if you do a tropical cut you’ll see a greatly enhanced amplification for the ENSO/volcanic short-term peaks and troughs in the satellite data vs surface). Arthur, do you mean that we’re looking at the combination of a spurious trend contribution and a wrong scale factor? Well, not necessarily a “wrong” scale factor – the satellites (at least MSU-based) measure something different from surface temperature – they measure emissions from throughout the atmosphere, and use various techniques to figure out the contributions from different altitudes. The trends usually shown as UAH or RSS are nominally from the “lower troposphere”, but that’s still not the surface. Because lapse rate (particularly in the tropics) should decrease under warming conditions (this is actually the most important negative feedback), the troposphere should warm faster than the surface. We see that in the short-term responses as the above graphs show. 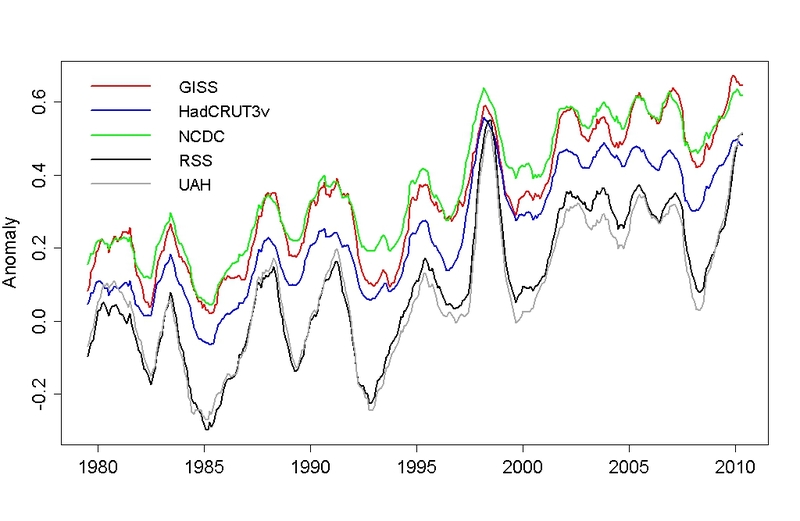 Why don’t we see that amplification over the long term in the UAH and RSS records? It seems almost certain this is a long-term calibration issue. You might want to look into the new STAR analysis from NOAA. It’s probably the most sophisticated. Interestingly, its “TMT” channel is warming at the same rate as UAH’s synthetic “TLT” channel. The data files seem to be in an unfriendly form. Might it be possible to get the data from you in a friendly form so I can try some Python PCA code I have on the data? I regularly update a csv file with the 5 temperature anomalies as well as NINO34, SSTA, PDO and AMO each month at this link . The data file includes monthly values for each series since 1880. I also have a series of RClimate tools using R to help fellow citizen scientists do their own climate trend analysis link. This doesn’t affect your results, but I think you have your terminology switched around: The term “eof” refers to the loading (which is usually a spatial pattern in these analyses), and “pc” can mean either the time-series or the combination of time-series + eof. Thanks for laying all this out. I hope I can learn a couple of even more basic things. Isn’t there another temperature database from NOAA, slightly different from NASA GISS for some reason? And isn’t there also a Japanese database? It would be very nice to have another country represented. The NCDC database is probably the one you are thinking of–NCDC is part of NOAA. Thank you Tamino! I find this analysis very educational, myself coming from a quite different speciality. I wonder if the Fourier method of harmonics breakdown would have any practical use in analyzing the annual Arctic sea ice extent cycle and its (future) deviations. I should also think a compact 3D presentation of the various climate datasets would be impressing. Make it rotatable even? Any takers? Tamino, great post, any chance of linking to the R code as well? (The graphs look R-ish to me). The last plot is definitely the best by far. It is particularly handy and puts the trends calculated from different time series into perfect context to understand why the “skeptics” are wrong. I’m trying to duplicate your results, and am having an issue. I suff in the five temp series (after subtracting the mean), and compute a covariance matrix. PC’s by v*matrix, where matrix is the 5,382 array. variation, so far, so good, but the PC I calculate is basically off in scale. So that argues I forgot a step. Do you have an idea of what I may have forgotten? I could post my python code if that would help. Is there an active open thread for off topic questions? I have some questions based on a couple posts at Coby Beck’s blog. Oh really? If you take into account the two major volcanic eruptions in the beginning of the observed period which had an approximately five year cooling effect each you will find that there has actually been almost no warming since 1980. [Response: I HAVE taken into account the el Chicon and Mt. Pinatubo volcanic explosions, as well as the El Nino/Southern Oscillation, and the warming is still there and just as strong. Oh, that’s funny. Something caused cooling, so the warming is just…. our eyes playing tricks? Grumpy must be grumpy because he can’t think logically. Or to quote the traditional British Civil Service school of Obstructionism, ‘Based on your conclusions, I disagree with your premises’. Thanks for the analysis, Tamino. I’m curious as to how you corrected the CIs for autocorrelation. Or could you point me toward a particular resource? I’m trying to find out how Spencer defines the different regions that are listed in his lower troposphere dataset. Does anyone know? As an aside, I’d sure like to see these simple time series ASCII files made available as netCDF with full metadata. Heck of a lot more useful that way. to avoid future confusion, is to agree on a common base period for all of the datasets. Uh, Dude. That is just what Tamino has done in figures 3 and 4. Yes, but they are relative to 1980 to 2000. My point was that it was possible to standardise them to 1961 to 1990. Also, what I meant was that the originators of the datasets should standardise their base periods to avoid the necessity of doing conversions, and confusion amongst those who are unaware of the differing base periods. But then there would have been ever so much less hilarity over to Anthony’s place, back in the ‘what’s an anomaly?’ days.. Sorry, Ray – the people who do and report serious science, typically aren’t all that concerned about whether it will be understood by ‘auditors’ who can’t bother to understand the data and can’t add a constant to a dataset. Nor should they need to be. I don’t know if it signifies anything, but the current satellite readings are moving up quite rapidly compared to January to March timeframe. We seem to be coming out of this La Nina very quickly. The UAH report for June should be very interesting… we might see the second or third highest June anomaly for the satellite readings. Only the El Nino years of 2010 and 2007 would be higher than June 2011, leading to a surprising result for a year that started with a reasonably strong La Nina. As we get data on more ENSO cycles, it will be interesting to see the statistics for the impacts of these events. 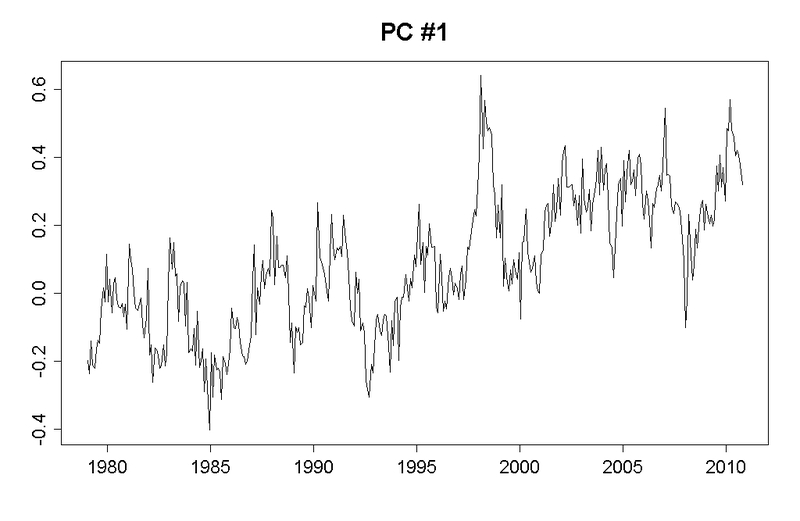 In particular, the satellite temperature models seem more sensitive to the ENSO cycles. Oops, forgot about 1998…. So it appears that June 2011 could be in line for the fourth highest satellite reading behind the El Nino years of 1998, 2010, and 2007. My estimate is somewhere between 2007 and 2005. Can June move it in range of top 10? decade of our century. A third of a degree warming is half of what is allotted to the entire twentieth century. This is the only real warming within the last 31 years. Checking pre-satellite era temperatures we find that the first half of twentieth century warming took place between 1910 and the start of the Second World War.There was no warming from the end of that period until 1998, a stretch of more than fifty years, while carbon dioxide kept increasing. Anyone wishing to claim the existence of the greenhouse effect must explain the absence of warming during this fifty year stretch. Beyond that there is more trouble for global warming in the Arctic. It turns out that Arctic warming also is not caused by the greenhouse effect. That is because it had a sudden start at the beginning of the twentieth century but there was no concurrent increase of carbon dioxide in the air. The real cause of Arctic warming is a rearrangement of the North Atlantic current system at the turn of the century that brought warm currents like the Gulf Stream into the Arctic Ocean. Arctic warming has been a showcase of the existence of global warming. With the greenhouse effect eliminated as its cause none of these observations count as proving that anthropogenic global warming is real. Magic markers really are …… magic! !